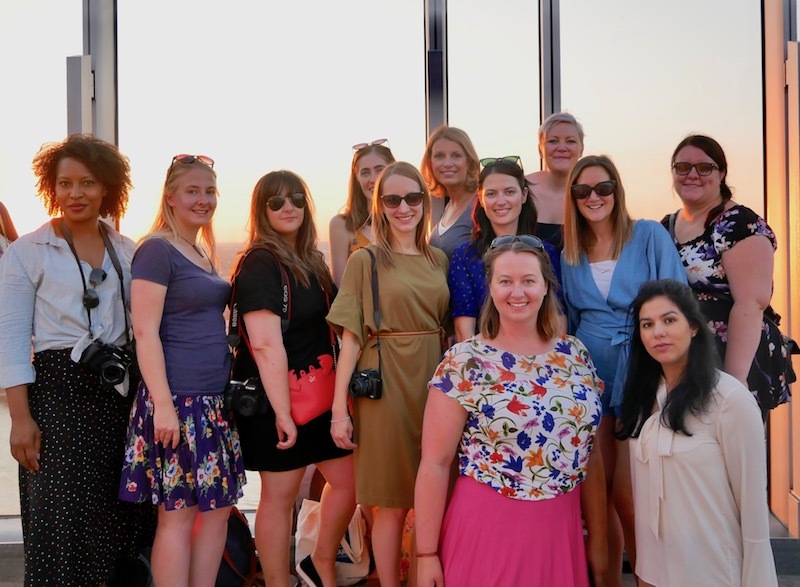 I was lucky enough to visit Cologne last summer with WowTrip (you can read my review of WowTrip from my first trip with them) for the second Blogger Course Weekender. WowTrip organise surprise trips and you find out where you’re going just before you fly! I’ve got to admit, Cologne wouldn’t have been my first choice for a city break but I was pleasantly surprised by this gorgeous city. There are many things to do in Cologne, but not so many that you feel overwhelmed with just a short break. I hate visiting a huge city and feeling like you’ve barely scratched the surface during a 48 hour break! 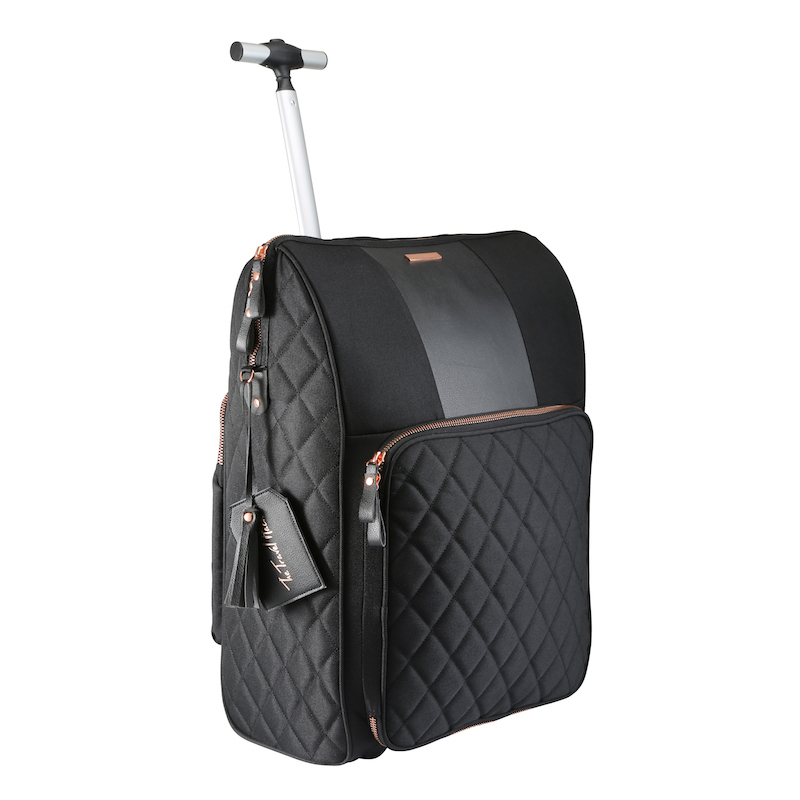 But with Cologne, you can really see a lot in 48 hours so it’s the perfect place for a weekender. Cologne is the fourth-largest city in Germany, and the largest on the Rhine River. Straddling the Rhine in Western Germany, it’s home to over a million people – so it’s no small town, but somehow visiting can feel a bit like you’re discovering a hidden gem. 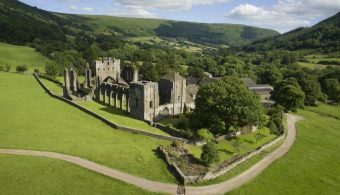 It’s an easy-to-navigate destination, perfect for a weekend break, with loads to see and do, and a rich history to explore. Make sure you brush up on your German before you go – not all of the locals speak English, so it’s best to know a few basic phrases at the very least. 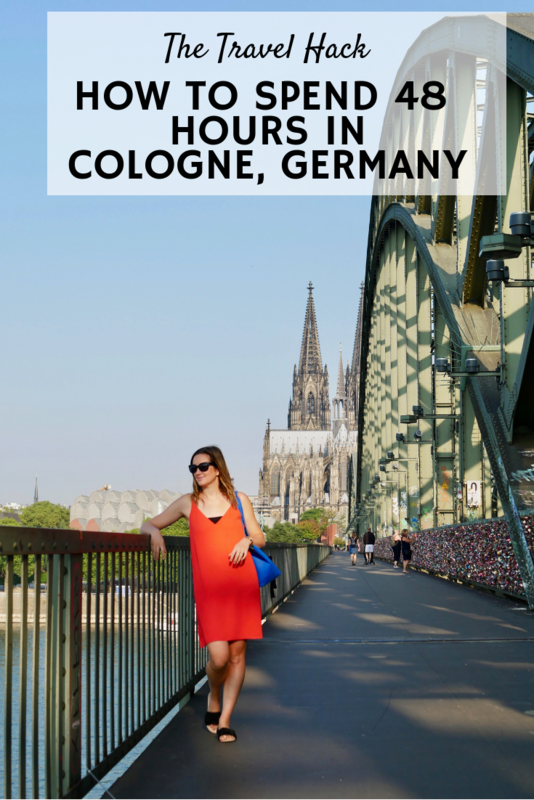 It’s easiest to fly to Cologne for most people from the UK and you’ll find plenty of budget flights. I recommend using Skyscanner to find the cheapest options! From London, the flight time is just under an hour and a half, and from Manchester it’s about ten minutes longer than that. You can also fly into Dusseldorf, which is only about half an hour from Cologne by train, and which has more frequent flights back to the UK. We stayed at the Holiday Inn Express Cologne – City Centre, which was newly refurbished, very clean and really easy to get to from the airport, but it was a little far from the attractions we were mostly enjoying, which were all concentrated around the old town. It’s a good budget option and breakfast included but you will do some walking while staying here. 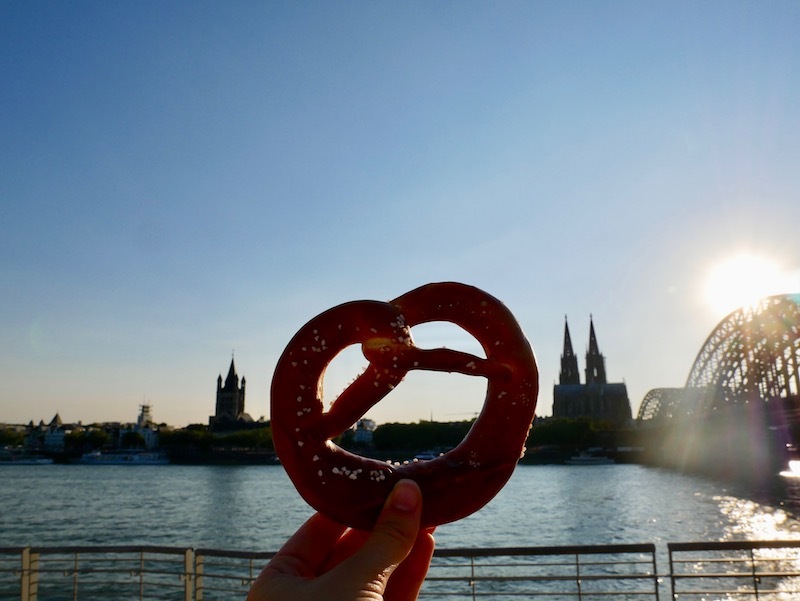 Once you’re settled into your hotel, take a stroll into Cologne and stop for a beer in the sunshine at Hafenterrasse am Malakoffturm – a casual bar that serves German pub food and ice cold beer overlooking the river and the chocolate museum. It’s the perfect way to say hello to the city, and ease into your weekend of exploring. Savour a slice of traditional German torte at this decadent cafe. Expect velvet chairs, sumptuous wallpaper, intricate sculptures and tasty treats – the perfect energy boost for more exploring in the afternoon. One of the best views in the city is from the top of the incredible Cologne Cathedral, which is the most-visited landmark in the whole of Germany. 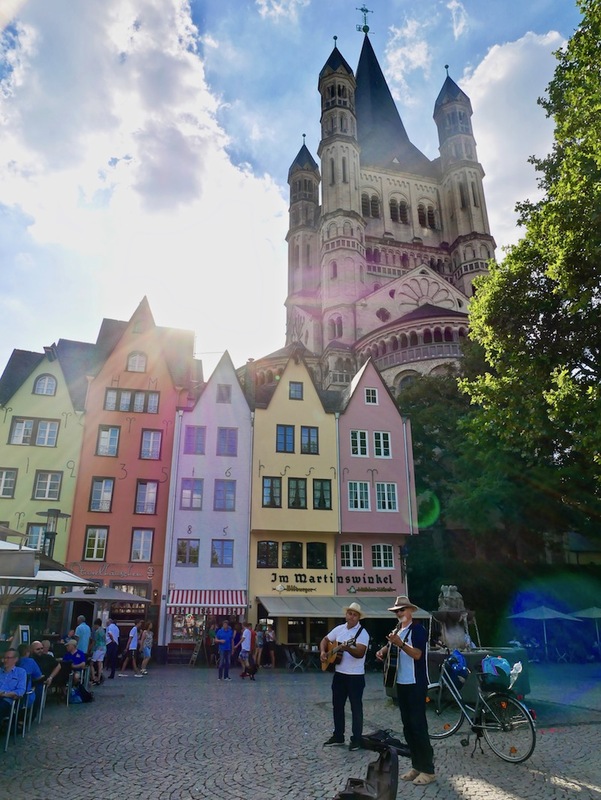 It’s the tallest twin-spire church in the world, towering over the city at 157 metres tall, which means it offers sweeping views over Cologne, the Rhine, and beyond. Take some time to explore the interior, with its stunning stained-glass windows, paintings and altar, and then purchase your €3 ticket to climb the South Tower. There are 533 steps, and along the way to the top you’ll pass the bell chamber, with the largest freely swinging church bell in the world. I know, I know, you’re not in Italy. But this restaurant is so good that it’s worth going a little bit rogue and grabbing a delicious dinner here. The portions are generous, the prices are reasonable and the ambiance is good…it’s an all-round 10/10 option for a hearty first dinner in Cologne. Fuel up for the day – either at your hotel, or at Cafe Rico, a popular local spot with a huge breakfast selection, great atmosphere, and gluten free options to keep everyone happy! One of my biggest all-time travel tips is to get out early, before the crowds, if you want to get nice photos of a destination. The light is beautiful early in the morning, it’s usually a comfortable temperature, and you’ll be able to get unobstructed views of the most popular sights in the city. Start at the colourful Fischmarkt square and stroll through the old town with its quaint buildings and pretty streets. No Cologne itinerary would be complete without a visit to a traditional brauhaus, or beer hall. These huge establishments can seat as many as a few thousand guests, each of whom is there to drink local beer, eat German food, and soak up the atmosphere. Früh am Dom is one of the most popular brahuases in Cologne; at over 100 years old, it’s something of an establishment in the city, and it’s well worth a visit for an hour (or two, or three, or four…). Grab some local beers (which will be counted by your waiter using pencil marks on your coaster), order specialties like wurst and pork knuckle, and enjoy the stunning traditional interiors. On a nice evening, there’s nowhere better to enjoy a memorable dinner than on the steps along the bank of the Rhine, across the Hohenzollern Bridge and its thousands of love locks. These steps are teeming with locals enjoying the views, as well as tourists soaking up the fun atmosphere (and the sunshine). Grab a picnic dinner at a supermarket in the old town (there are a few places inside the main train station, right next to the cathedral, where you can grab a takeaway bite) and stroll over the bridge to enjoy a leisurely dinner like a local. If you think the view from the steps is good, just wait till you see from the top of the KölnTriangle! Located on the 29th floor of this building, the viewing platform offers a 360 degree view over the city, including the impressive Cologne Cathedral. Entry to the platform is just €3 (or, if you’re in a group of 5 or more, it’s just €2.50 per person), but be warned: there’s nothing up there to do as such (they really should add a bar!) so you’ll really just be going for the views – which are amazing. If your hotel doesn’t provide breakfast, try a Cologne staple: a nougat pretzel (nougatbretzel). These delicious bready treats are covered in toasted almonds and filled with chocolate, for a sweet twist (pun intended) on a German classic. After checking out of your hotel, head to the shopping district of Neumarkt to explore the boutique (as well as high street) shops in the area. It’s a bit of a walk from the old town, so if you’d rather save your energy for shopping, it’s easy to catch a train for two stops from Cologne Central Station. 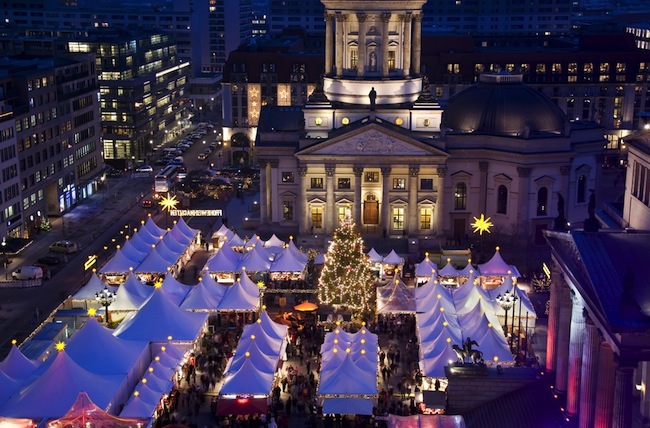 If you’re in town in December, one of the city’s biggest Christmas Markets can be found right here in Neumarkt too. If shopping isn’t your thing then do as the locals do (and we did too!) and head to one of Cologne’s lovely parks. We walked to Volksgarten Park for a Sunday stroll and had a delicious and traditional lunch at Hellers Volksgarten. It’s always sad to say goodbye, but with a weekend of adventures to boast of to your colleagues, at least there’s one reason to look forward to Monday! Cologne was such a fun trip and also a lovely city to explore. Fab photos!